You planned the most amazing day and enjoyed every minute of it and now you are settling into married life happy and content. But there is one small problem! And it could be that you don't have enough space in your new home. Or that your wedding was a bit more expensive than you were hoping it was to be? And there is a solution and that would be that you could sell some of the wedding items that you have left over. That would make more room in your home, because do you need to have 12 identical vases taking up space in your living room? Do you have some wedding craft pieces left over? Stored all round your house? Then selling those would also give you some room and also some extra cash. So to save you from a house full of extra wedding items I have put together "How To Sell Your Wedding Stuff "
Would you like to sell your wedding dress, pay off some debts or have a fantastic second honeymoon? Did you buy more than one wedding dress? You are not alone if you did! Lots of brides do end up buying more than one dress because they started to panic that they would never find "the one". As you can see there are some wedding items that you may not have thought about selling and there are detailed directions on how to sell your wedding dress too. With your wedding dress being probably one of the most expensive items from your wedding this will enable you to make the most from your sale. You will also be making another bride very happy with all of your lovely wedding items. 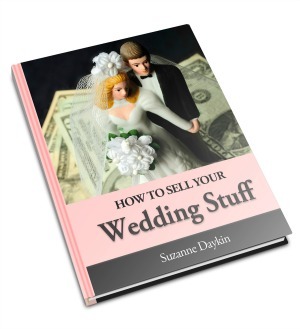 How To Sell Your Wedding Stuff - is available as an e book from Amazon.